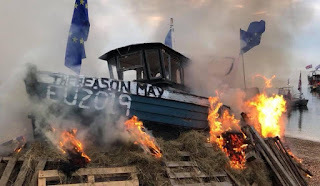 the Ulster Folk: No Deal, Theresa's Deal Or People's Vote? Image: courtesy of Fishing for Leave. I was invited to participate on a panel discussion for Sky TV News this morning at 9.30am. There were four of us on the panel for a 10 minute slot. It was short and a bit frantic: probably the way TV news is meant to work, but I was disappointed that I didn't get to make some important points. So I am going to express them here instead: in bold. In advance of the show, Sky asked me what I thought of 'No Deal, 'Withdrawal Agreement' and 'The People's Vote'. If I had had the opportunity I would have expressed my concerns about all this terminology. The so-called No Deal has negative connotations and allows for some to interpret leaving the EU under WTO terms as crashing out of the EU. No Deal however is exactly the same thing as the Leave the EU option that was on the ballot paper in the referendum: the option that the majority of the people in the United Kingdom, of Great Britain and Northern Ireland, voted for. Once we leave the EU, for real, the deals with the EU and the rest of the whole wide world will automatically follow. I did get to talk a little bit about Theresa's Deal,(the Withdrawal Agreement) but here it is with more detail. The so-called Withdrawal Agreement, was actually just an in-house agreement between the EU and their devotees who currently control the British Establishment: the British establishment that is currently part and parcel of the EU Establishment. They are all up to their oxters in the one big Brussels trough of abundance. It is NOT an agreement between the EU and the people of the UK. It is not Brexit in any shape or form. It allows the European Court of Justice to interfere in the internal affairs of the UK indefinitely. The Irish Backstop keeps part of the UK in the EU's Single Market and under it's laws indefinitely. My attempts to explain why there was absolutely no need for a Hard Border and that it was just a ploy to obstruct Brexit were met with a seemingly synced chorus of disapproval from the two Remainer panelists and the presenter. Nothing new there. And I was disappointed that I didn't get a chance to voice my opinion on the so-called People's Vote. The Peoples Vote is something else - it is a classic example of Orwellian Doublethink, and Newspeak (Doublespeak if you like). We, The People, already voted in 2016. And in the General Election of 2017 we, The People, instructed our elected representatives to just get on with their job: of implementing the democratic wish of The People. I did get to say a little bit about why I voted Leave. But here it is in full. It was primarily about independence, about freedom: about the United Kingdom being free of the shackles of EU rules and regulations – getting out of their Single Market and their Customs Union. It was about no longer being under the control of the European Court of Justice. It was about democracy as I understand it. It was about being able to hold our elected representatives to account in a proper democracy. and being free to establish new trade arrangements with nations across the world, including the EU. It was about regaining control of our fishing grounds, reviving our seafood processing industry and being able to develop a sustainable programme to preserve the fishing industry for future generations. It was about being able to develop a sustainable immigration strategy to suit the needs of our economy. I would have loved to have been able to talk about the fact that an Irish Border Poll would now be the exact same thing as a 2nd EU Referendum. It used to the case that a Border Poll would have been about the possibility of Northern Ireland leaving the UK to become part of an independent united Ireland that was controlled from Dublin. But that's not possible now as the Republic of Ireland is currently controlled by Brussels and Berlin.. I would have loved the opportunity to talk about how Irexit is gaining momentum down south. Oh Well! I'm not sure how many people watch television at 9.30 in the morning anyway? And if I had had the opportunity, just before the camera stopped rolling, I would have shouted out, Your so-called No Deal simply means Leaving the EU!